Genaro Moreno received his art education at the Círculo Artístico del Zulia (1939-1944) and the Escuela de Artes Plásticas y Aplicadas in Caracas (1945-1949). He participated in several national art exhibitions (salones) and presented his first individual exhibition at the Taller Libre de Arte (Caracas, 1949) when he was still painting in a fauvist style. In 1950, he travelled to Paris, where he joined the group Los Disidentes and adopted geometric abstraction. He presented solo exhibitions in the French capital at the Galerie Barbizon (1950 and 1951) and the Galerie Centre Saint Jacques (1953), and continued his education at the University of Paris (1953-1954). He also studied art restoration at the Real Academia de Bellas Artes de San Fernando in Madrid (1957-1958). The works Moreno produced during those years were situated between constructivism and kinetics. 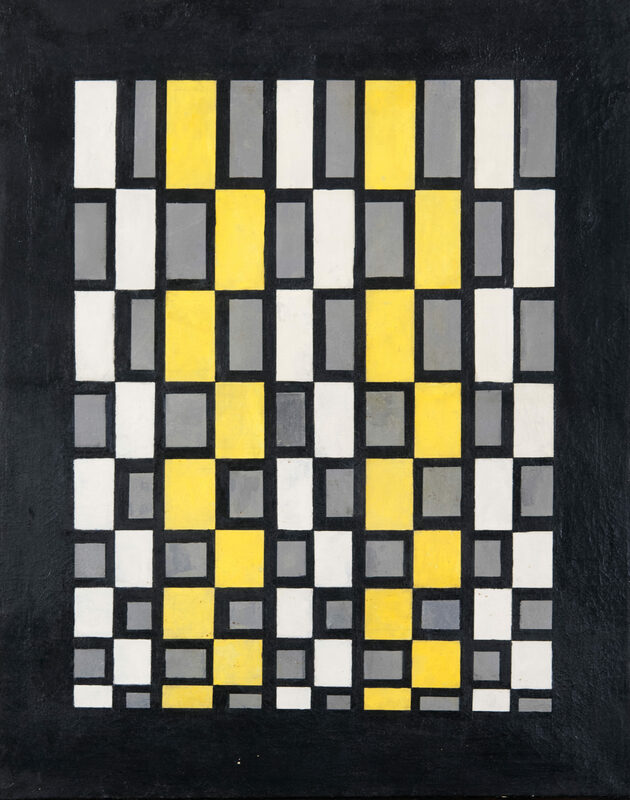 Colors were organized in orthogonal planes and that contrasted with the black backgrounds, alternating in series that produced regular rhythms. In 1959, upon his return to Venezuela, Moreno dedicated himself to teaching and stopped exhibiting until the mid 1970s. A series of exhibitions presented between 1975 and 1982 at the Galería Carmelo Fernández (Caracas), demonstrated the evolution of his painting during his second period. In Movimiento geométrico del color (1976), he continued the investigation begun twenty years earlier, which focused on color planes. The backgrounds were longer black, but rather marked by monochromatic or polychromatic bands that enhanced the optical vibration of the square or rectangular forms that were superposed on them. In the series Arte Concreto-Espacio dinámico(1978), using the effects of light and shade, the planes became three-dimensional modules that produced ambiguous effects of relief on thesurface. These works were also shown at the Galerie Vercamer in Paris, in 1979. The perfectly symmetrical disposition of the modules reached their ultimate effect in Simetría modular (1979). In contrast, in Energía cinética (1981), the orthogonal shape that had characterized Moreno’s works since the 1950s began to disappear from the point of view of the observer, presenting itself only as a three-dimensional illusion created by light and shade. At the beginning of the 1980s, Moreno resumed teaching. Among his most important retrospective exhibitions are Formas puras espacio color: 26 años de pintura geométrica (Galería del Consejo Nacional de la Cultura, Caracas, 1977) and Homenaje al maestro Genaro Moreno en sus 36 años en la pintura geométrica (Museo Caracas, Palacio Municipal, Caracas, 1986).